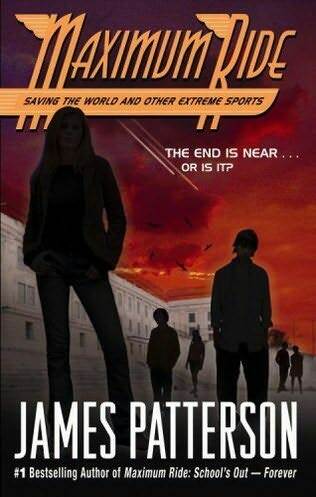 Stupidity takes a well-deserved day off (I didn’t leave the house at all yesterday or answer any phones in case I’d run into a vacant mind) to give me a chance to review the latest young adult book offering by brand name author, James Patterson: Maximum Ride 3 ~ Saving the World and other Extreme Sports. Science fiction and fantasy are not my genres of choice. But from the very start, this energetic read showed no signs of letting up. Fast-paced and well planned, the short, crisp chapters reeled me in; I couldn’t help but fly right beside Max, Fang and the whole gang as they set out to save the world from obliteration. Six genetically modified kids, ranging in age from six to fourteen, strive to overcome the very mad scientists that created them. The “whitecoats,” become these children’s, and the entire planet’s, worst enemies. Another tome about the co-existing forces of good and evil. Hardly an original concept, but what the plot lacks in inventiveness, it makes up for in action. The kids in Maximum Ride 3 are hip, smart and just happen to have amazing flying ability. They’re the only ones of their kind to have escaped the whitecoats and survived on their own. Consequently, they’re street-wise and world-weary. I hadn’t read the first two books of this trilogy, but I felt unhampered as this was simple to follow and to the point. The leader of the flock is sassy Max, a young girl with grit and moxie, not one to hold back when it comes to speaking her mind. At first, I found her nonstop sarcasm a bit much. But honestly, what did I expect from a parentless girl forced to fend for herself against the odds and elements? The majority of grown-ups in her short life were wicked and bent on wrecking havoc. When did she have time to learn ladylike manners with survival on her mind, not to mention saving the world? Details that could delay the action are conveniently discarded (how did the kids buy airline tickets without money? And who was the mutant in the castle that passed the note to Max?). I wish James Patterson had opted to discard the attempt at romance between Max and Fang. It seemed out of place. And weren’t they a little young and terribly busy? For me, it was an unnecessary distraction from the action; I was relieved it was brief. No search for deeper meaning required in Maximum Ride 3. Just a carnival ride, exciting and fast-moving. Don’t get me wrong. These kids are set on doing the right thing and surrounding themselves by the right people. Responsibility, loyalty, and trust are often put to a test. Not bad virtues to pass on to young readers. If you’re looking for flowery prose and detailed description, you’re not going to find it here. The rare similes that appear consist of examples such as Total the talking dog squirming inside Max’s “jacket like a gopher in a hole.” But you’ll find action galore. My sixteen-year-old, currently reading The Scarlet Letter for his English class, peeked over my shoulder as I read. Maximum Ride 3 appealed to his sense of brevity and fun; a light-read, not requiring a dictionary by his side to define terms like “assiduous” and “desultory.” What you see is what you get and that was just fine with my son. If you give youngsters a choice between going to the Metropolitan Museum of Art or Disneyland, which do you think they’d choose? If it’s Disneyland, then this is the book for them. Tomorrow my quest to overcome stupidity while maintaining sanity resumes with A Case of Mistaken Stupidity. The direction and outcome of our daily undertakings depends on how we react to various situations. Meaning, sometimes our having a good vs. a bad experience may depend on how we interact with stupers (lest we forget, short for undeniably stupid persons). If a stuper crosses your path, your primary focus should be on maintaining your sense of well being and sanity. Sometimes, to battle stupidity swiftly and efficiently, certain tactics must be employed. My sister, Vanessa, went shopping to buy furniture. A simple enough endeavor. One that should and could run smoothly and without incident…unless, of course, there’s a counterfeit human involved. The store Vanessa visited advertised that they were having a sale to beat all sales. There was one slight problem. The super discount didn’t start for four days. What if a potential customer wanted to buy something immediately, but at the upcoming sale price? I kid you not. She stared at me for so long, I considered giving myself a manicure and pedicure while I waited. I easily could have. Finally, I just strolled away to a different part of the store. I bought the couch on the spot. How is it that one employee regarded a pre-sale purchase as challenging as attempting a diamond heist at Tiffany’s with one hand cuffed to the security guard, while the other salesperson equated it to stepping lightly over a sleeping dog? For a stuper, the world is black and white. Either something can be done or not. There is no creativity, which requires thought and contemplation. This saleslady in this situation could have asked for assistance from a manager, but if such a higher level authority was hidden from her sight (which was probably the case here), that ain’t gonna happen. Remember, stupers view the world through a straw. Vanessa did the only thing she could. Persisting with the stuper would have done neither party any good and resisting stupidity would only have made Vanessa angry. She just removed herself from the presence of the meager mind and found an authentic, thinking human. Last night I lay awake, pondering the relationship between the average car horn and stupers (that’s right – short for those aggravating stupid persons). I determined that the two were made for each other. It started on a recent trip to Los Angeles. I walked with a group of people in a well-marked, clearly designated crosswalk on Wilshire Blvd. Even if you were blind, you’d feel its very presence. Before making a right turn, a Ford Mustang patiently waited, at a red light, for pedestrians to complete their trek to the other side. Smog was light. Shopping was plentiful. Life was good. Suddenly, a silver Lexus stopped behind the Mustang and leaned on its horn for about the length of time it takes an average person to peel an apple. In Los Angeles, people don’t just tap or beep, they lean and blow like contestants vying in an Olympian horn honking competition. One look at the Lexus driver’s half-smiling, half-silly face showed me that this was no emergency. It was just a stuper enjoying his toy (insert expletive here). The lengthy ear-splitting honk only made me want to plant my feet firmly to the confines of the crosswalk and take up the stride of a three-legged tortoise. Somehow, I managed to cross without incident. Was there a possibility that the Lexus motorist didn’t see the fifty or so people walking during what was a green light for them and a red one for him? (Insert banshee-like shriek here; don’t forget your earplugs). Minutes later, at an entirely different intersection with different cars, I heard it again: this shrill blare took so long that I considered the possibility that the automobile sound mechanism went haywire. The horn must have either broken or been part of some sort of alarm. But in fact, a car was stopped at a red light. Behind it sat a queue containing six vehicles. Motorist number six was doing the honking. The lead car had failed to press the accelerator petal during the .005 seconds allotted to move once the light turned green. Where I live, in the quiet countryside, people do not use their horns. I’m not kidding. Yesterday, I sat behind two cars, waiting to make a right, onto a highway. When the light turned green, the motorist upfront dozed comfortably and unaware. I could almost make out the pillow behind his head. Quail quietly crossed the street, squirrels took their sweet time stopping in the middle of the highway and snacking on nuts. No one honked. Not even me. Eventually, the motorist awoke from his dream-state and moved. Was the napping driver a stuper? No, just someone who had stepped away from reality for a moment or two or three and returned the moment he realized his mistake. It was not for us to punish him. Using the horn is a deliberate choice. In this instance, we simply chose not to. Were the honk-happy L.A. motorists stupers? Yes! They lacked the necessary survival virtues of patience and awareness. They regarded their cars as suits of armor. While wearing the suit (or in this case, sitting in the car,) they maintained an air of false bravado. Remove them from the vehicle, and it’s a different story. The car horn is a safety device used by intelligent, aware drivers to warn others of sudden situations. Our job is to use it only when necessary. It is not a tool or toy to be misused by stupers. Living in the country has shown me that using a little patience and courtesy helps me maintain my sense of well-being and keep the stupers away. There’s a habit so vile, a vice so loathsome that it can only be practiced by stupers (short, once again, for chronically stupid persons). I refer to the affliction known as… littering. Human garbage dispensers regard the world as their personal waste bin. Teens drop food wrappers mere feet from brightly hued, easily viewed waste containers. Indifferent picnickers watch rubbish blow gently away in the wind. Car windows roll down not just for fresh air or to wave a hand or the finger, but to shamelessly spread trash. We’ve all witnessed pieces of litter carelessly pressed against a curb or intrusively entangled in the arms of weeds and shrubs. Littering is selfish stupidity at its height. These stupers are not blind or hindered by a visible physical handicap. They could be suffering from DDD (Decent Disposal Disorder). Before I continue, those of you exceptionally intelligent readers may’ve noticed that I do spend a fair amount of time here diagnosing all sorts of maladies pertaining to stupers. It’s because I have a plan. I’m going to open my own pharmaceutical company and oversee the creation of drugs and medications directly relating to disorders suffered by stupers. These drugs will contain a slew of delicious side effects (i.e., vivid dreams featuring Jack Black, a propensity to mistake Pepto Bismol for red wine, a compulsive need to stalk mailboxes). I can’t wait to personally test some of these side effects myself, such as sudden impulse to gamble, or extreme desire to shop uncontrollably at Bloomingdale’s. But I digress. A few days ago, I walked along a beach located in an affluent community. A respected university sits nearby; consequently, many college students reside in this town. As I strolled, I saw adventurous seagulls gliding beneath the start of a glowing sunset; shimmering waves wrinkling the smooth sea top; golden sand dented by three couches piled up, one on top of the other; a forlorn iron patio chair captured by a tangly piece of seaweed; random tires; picture frames and tennis rackets. Even a new motorcycle lay crushed and broken. Cast-off by counterfeit humans; dumped on the shore from the cliffs above. Discarded and forgotten like used toothpicks. This profane spectacle was so disheartening that local television crews were on the spot interviewing distraught locals. The unsightly mess was likely deposited onto the beach from apartment buildings standing above. Undoubtedly, stupers lurked in and around these seemingly innocent structures. This last response was made by a thinking, intelligent being who led a volunteer cleaning crew. I asked the leader why he bothers cleaning up knowing the meager minded would deposit trash again and again. I would have added that this beach belongs to all of us. It was here before we were and will be here long after. We all must share in the responsibility. After interviewing a few of the landlords of the suspect buildings, I concluded that college students were the unworthy culprits. I did say, in a previous post, that I don’t pick on the very young or the very old. I consider college age kids off-limits too. However, they must at least utilize common sense. They’re typically accepted to university because of keen mental faculties. There’s no excuse for regarding the beach as a dumpster. I think the university should require that students pick up the trash. That may prove a deterrent to littering in this case. Meanwhile, should we pick up the droppings of the vacant minded or should we just shriek and stamp our feet? I hate to say it, but in order for intelligence to prevail, we must take control. Perhaps if enough of us did, these stupers would take to mimicry per the stampeding cow mentality. This refers to the fact that cattle do not think alone; they think en masse. Hence, they are only capable of imitating each other. Stupers, watching the intelligentsia clean-up, could take to doing it themselves. Isn’t it worth a try? I suffer from S.A. No, not Stupidity Aversion (although I have that too), but terrible Separation Anxiety when it comes to my kids. When my older son (Sonny) started kindergarten, I nearly tied myself up in knots. In the beginning, I sat in the back of his classroom, helping his wonderfully patient teacher any way I could. She was on to me, but being wise, always assigned little tasks to keep me busy. I gradually moved to a spot outside the room where I stood, glued to the window, watching my little guy add up numbers, splatter paint all over his clothes, and install Windows 95 on the class computer (he always was technically inclined). Finally, I moved a few feet away to the nearest bench and eventually made it out into the parking lot. This took about three years. From kindergarten through second grade, Sonny had excellent teachers. Then came Mrs. Patton. Prim, proper, mature and seemingly stern, she appeared the model teacher. Parents of older children told me that Sonny was lucky to have her. I made it a habit to drop into the classroom at random intervals. I wanted to see this marvelous educator in action. One early afternoon, I happened upon Sonnys classmate, Ben, wandering around, unsupervised, on the playground during class hours. I mentioned this to Mrs. Patton whom I found carefully applying lipstick at her desk while the class giggled, whispered and passed notes. I suppose twelve students could be burdensome. And then there were the bookshelves. Some teachers grew gardens with their students. Mrs. P. grew dust. Dictionaries, encyclopedias, classic literature all maimed by thick, wheeze-inducing dust. Mrs. Patton didnt believe in books; she believed in the Franklin electronic dictionary. When Mary wanted to know how to spell curious (i.e., desiring knowledge), the Franklin dictionary gave her curios (i.e., unusual object of art). I learned that Mrs. P. couldnt spell on the third grade level; she couldnt correct her students. I wasnt happy. A stuper (yes, short again for an inconceivably stupid person) was posing as a teacher. The final straw occurred when I picked up a tearful Sonny after school; he informed me that he’d been punched in the stomach by another child. He added that Mrs. Patton had told him, See what happens! He asked me what she’d meant. Sonny is a cerebral, thoughtful, cautious young man, not prone to violence. Unlike me. I briefly considered finding the kid and/or his mom and demonstrating what I’d learned while watching Bruce Lee movies. Instead, I marched up to Mrs. Patton and asked her what happened. Why, I thought the school called you, a bewildered Mrs. P informed me. Its not easy to look stupidity in the eyes and attempt to make sense. Its like watching a dog walk backward on its hind legs. Its not done well. Youre surprised its done at all. There were other incidents, such as “the auto harp is more important than math” lecture, and the “wait for the medication to kick-in” episode, but those would take too long to discuss here. It wasn’t any one act that lowered the intellectually impoverished Mrs. P to stuper level. It was a series of stupid blunders. Psssst! Over here!” a woman tossed her head up, either doing a fine imitation of a spirited stallion or attempting to get me to move closer to her. I moved closer. Mrs. Patton went on to teach at a neighboring private school where I heard the parents, including a good friend of mine, gave her rave reviews. When I told my friend that Mrs. P. was a counterfeit human, she regarded me in disbelief. Some people need to learn for themselves. I can be an extremist when it comes to my children (just ask them). I needed to know that the person they spent almost ten months of the year with, for at least seven hours every weekday was exercising vigilant intelligence. The only way to know was to observe periodically, in person. With younger children especially, it’s important to make parental presence and involvement known. There are stupers out there who underestimate the intelligence of kids…and overestimate their own. Periodically, I engage in a song & dance routine. I get out my black, patent leather shoes, pink bow tie and glittery cane. I’ve performed this little tap at four branches of a local bank in order to obtain necessary paperwork for a loan. My husband occasionally buys and sells real estate. Hence, the need for loans. To borrow money from a lender, we must prove that we don’t really need the money (excuse me while I go and grind my teeth for the next eight minutes). My energetic little jig is usually followed by polite, staccato applause from my small, subdued audience; afterwards, I am handed the requested piece of paper to show the lender. I typically begin my journey to the exit, but rarely make it out the double glass doors. Along the way, I notice that the paper, which summarizes the balance of my accounts, provides no evidence whatsoever that it originated from a bank. I could have typed it up myself. So begins a mad dash, zig zag from drawer to drawer by the employee in search of the elusive stamp. This occurs each and every time and can last anywhere from four to twelve minutes, depending on the I.Q. of the person assisting me. (That was mean. I’m sorry. I.Q. has no bearing whatsoever on stupidity. Highly educated people can be impossibly stupid). Yesterday, Husband and I entered the branch closest to our home to add his name to an account that I have. Doesn’t that sound delightfully simple? Nancy assisted us. We obtained proper signatures and left to get my mother’s signature as she was also on this account. We did so. Husband returned the signature card to the bank (I didn’t have my tap shoes on me). It was his turn to secure the little piece of paper. When Husband entered the bank, Nancy was nowhere to be found. He overheard some one say, “She’s in the lunch room, doing her nails.” Husband was advised that no other person, out of the 15 employees present, could add the signature and print out the paper he required. He asked to see the manager. Husband said, “No problem. I’ll wait. I really need to deliver this paperwork to the lender today.” Husband showed Manager a sample copy of what he needed. Husband left. He filled up the gas tank, stopped to get coffee, then drove five miles to the next branch of the same bank. This time he met a perspicacious (i.e., very smart) teller who printed what he needed in less than ten seconds. Unfortunately, it took another four minutes to find the infamous official bank stamp. Why? Why must we jump through hoops and perform astonishing feats of ability in order to survive an encounter with stupidity? Well, first of all, so I can run this blog. Secondly, to sharpen our minds. Those who can think and do, can always beat ten men who can’t and don’t (if I may paraphrase George Bernard Shaw). Don’t you feel a sense of accomplishment when you’ve resolved a problem or completed a task, no matter how large or small? Stupers (short for abysmally stupid persons) don’t know what that satisfaction feels like. And never will. No, there was no crystal ball involved in any of the above predictions. And none are transcripts from 1-800-psychic. A physician made each pronouncement. First of all, I have nothing against medical professionals. I know many fine doctors and surgeons. But when they speak without thinking, resulting in a quick, unfinished assessment, they fall into the ever-popular category of stuper (yes – short for a preposterously stupid person). “She will be on meds for the rest of her life.” So said a well-known physician to the mother of a six-year-old suffering from a bacterial infection. Today, this little nine-year-old girl feels fine and is medication free. What made this quack think he could see the future? Ouch! My Aussie Shepherd, Rio, lying by my feet, just nipped my ankle when he heard me read that one out loud. There I go again. There was no thought! By virtue of being knighted a doctor, he automatically knew all. This youngster’s mom did her own research and discovered that diet played a vital role in her daughter’s condition. When the diet changed, the disease vanished. “If you leave the hospital tonight, you will die.” This was told to my now ninety-year-old grandma, after I took her to the emergency room five years ago. She felt light-headed. The ER doc told her if she went home, he wouldn’t be responsible for her death as she was suffering from congestive heart failure. Grandma wanted out. She felt she’d die if she spent the night in the hospital. I took her home. Grandma managed to somehow survive. And is doing well today. “These hormone pills are your only hope.” So declared a physician to twenty-year-old me when I suffered from a female disorder. I took the pills; the condition went away. When I stopped the pills, the condition returned. I didn’t want to take drugs in perpetuity. My mother advised, “You need iron.” I took an iron supplement. I never had that problem again. Duh! Why didn’t Doc think of that? Yikes! This time Rio slammed his paw down on my bare foot. Sorry, I won’t forget again. As always, think is the key word. Matt requested permission to discontinue the drug for a month. Dr. B reluctantly agreed, saying they shouldn’t delay the operation. Matt stopped taking his medication. His kidney returned to normal. Why didn’t Dr B consider the fact that every single patient is an individual specimen of life with unique needs and side effects? Why didn’t she bother to think? (This time Rio just looked up at me and smiled). Do some physicians moonlight as fortune tellers in their spare time? No, but the average doctor spends no more than twenty minutes per patient. It’s a lot easier to view these patients collectively than as individuals. It saves time and effort. I found it scandalous that Dr. B admitted to seeing hundreds of patients weekly. That’s basically an admission of overwork and inability to allocate time for individual analysis and understanding. It didn’t help her cause that she wore diamond earrings the size of golf balls. No patient needs to view how their fees are spent. Especially while consulting the doctor in the office. Don’t be afraid to disagree with your physician. And do take the time to do your own research so that you have some understanding of whatever ails you. This will let the doctor know that you are in charge and not at his/her mercy. Your medical expert should be your partner, working with you to resolve the malady. Do not accept anything less. If your doc won’t work with you, then find one who will. They do exist. Any physician who expects patients to mutely follow his/her decree is a stuper. These doctors believe they don’t need to think because they just know… by virtue of their degree. What would happen if medical professionals fostered an open mind and devoted more time and understanding to each patient? There would be happier patients…and doctors. A little thinking goes a long way. Why do some people drench themselves in overpoweringly pungent, nostril hair-burning perfume so that we must smell them coming? Why do others bellow into their cell phones while flushing the toilet in a public bathroom stall, behaving as if they were in a private phone booth? And most importantly, why do people tailgate? Yes, you are correct. People engage in such feats of stupidity because they are…stupers (short once again, for those astonishingly stupid persons). Let’s discuss tailgaters. But first, let’s discard those who purposefully, impatiently tailgate, as that requires thought and planning. I refer to the ones who mindlessly drive nose to bumper. Serial tailgaters, if you please. I often drive on a winding, somewhat mountainous highway. One end leads to a ritzy, French Riviera style beach community. The other end lands at a pastry paradise-slash-Toon Town type tourist destination. As you may imagine, this highway is well traveled. And I am tailgated three out of five times. The speed limit is fifty-five miles per hour. Mindless tailgaters appear rather suddenly, whether I drive fifty-five or eighty-five mph(which I never do as that would be over the limit), and they stick to my rear bumper for no apparent reason. Tempting as it is to quick-slam on my endearingly sensitive, immediately responsive brakes, and then gleefully race away to teach the imbecile behind me a lesson, I can’t. I am a worthy role model for my children; I cannot allow them to see their mother behaving in such a manner, delightful as it may be for me. I just patiently wait for the dolt behind me to move into the passing lane. Just yesterday, a small truck closely followed me, heat-seeking, homing torpedo style. I drove sixty-two mph. Please note that I have no bumper stickers for casual, while-you-drive reading nor is my rear bumper uniquely attractive. Yet, the tailgater persisted. The passing lane stretched out lonely and ignored; the truck didn’t budge. Its lips locked on my fender. I dropped my speed just a little. Suddenly the truck driver awoke out of his stuper trance, passed me and moved on. I think, as a whole, many people live a habitual, mindless rush of life. Thinking is virtually obsolete. These dimwitted drivers are mostly oblivious to the fact that they are tailgating. Why is it necessary to stay close to the car in front? Perhaps these drivers experience insecurity in this big, scary world, particularly on the highways. Hence, the need to be attached to another by way of tailgating. So what should we thinkers do? I like to leave plenty of room between the upfront driver and myself so that I may confidently brake, if necessary, in ample time. Especially if there’s a driver behind me who needs to establish some sort of connection. So rather than complain about the vacant minds floating about, let’s roll up our sleeves and practice diligent thought and patience. Maybe then, the meager minds will follow suit per the herd of sheep mentality: What one does, the others must do also. Thought turns the gears of life. Stupidity sometimes has a cheeky way of bubbling to the surface…belatedly. I really didn’t appreciate such question and answer sessions. Where were they headed? What the heck was the point? I’ve been known to be vain and superficial during moments of weakness. Since I hadn’t seen many of my relatives in quite some time, I felt slightly guilty and insecure. When someone pays me a compliment during such a vulnerable time, I may be prone to immediately bestowing the title of “dear friend” upon the flatterer. So we continued chatting. About our lives, our husbands, our kids, and then we trailed away as others greeted us. I did enjoy seeing her and catching up. Ah, if only it had ended right there. Let me explain about “that.” “That” was a thin bandage, less than an inch long, on my upper chest. It covered a small, but irksome, cyst resembling a nasty pimple. I’ve been to the dermatologist three times. Three times, he’s removed it, and three times, it’s returned. The little bugger enjoys the limelight. However, I do not enjoy its presence. So, until I go to my next appointment, I cover the pesky blemish with a small bandage. I really don’t like to acknowledge its presence; it’s an eyesore (I did say that I can be vain, didn’t I?). Did I want to discuss this with someone I hadn’t seen in almost twenty-five years? No. Especially when I anticipated further comments or queries. So to pacify her I told her it was a pimple in the throes of eruption. I painted a picture so she wouldn’t need to ask, “Can I see it?” or some other idiotic question. Annika stared at the innocuous bandage (no, it didn’t have colorful dinosaur figures or rainbows on it, and no, the blemish itself was not visible) for about thirty-eight seconds. Ever patient, I waited while she absorbed my explanation. I didn’t even engage in foot tapping. I’d already posed this question earlier; yet at that moment, I felt it bore repeating. Anything to move on to a new topic. I escaped shortly thereafter. I find an effective line of defense against uncompromising stupidity is to play the role of interrogator yourself. You pose the questions thereby controlling the flow of conversation. This keeps the stupers (short, once again, for those singularly stupid persons) talking about themselves with little chance of blurting out ridiculous remarks that pop into their feeble minds. Have you ever contemplated inflicting a moderate-to-sizable dose of bodily harm on another person? How about while shopping in a department store? The answer is almost always yes – at least when the other person is a stuper (short for those remarkably stupid persons). “I’d just left the cosmetics section. Then I turned around and saw this girl, running towards me in what looked like slow motion. She held a hand out in front of her, and in it, she was holding a Q-tip with a glob of white cream at the end. She ran up to me and said, ‘This is a great new eye cream perfect for your wrinkles!’ She didn’t just say ‘wrinkles.’ She said MY wrinkles. I told this obviously semi-blind, possibly lobotomized *&($#, that I already used an eye cream that worked well. I turned to leave, and she had the nerve to ask which one. I told her they didn’t carry it in this store, and I took off. I didn’t want to risk hearing another stupid word out of her. Later, I went back to buy a lip-liner. Mine had fallen in the toilet (don’t ask). I couldn’t remember the color so I asked for help. This time, the salesperson, while supposedly helping me, kept her eyes fixed, off to one side, on the escalator. Sometimes, when a stuper gets ready, aims and fires, they inadvertently hit the bull’s-eye. This was the case with the eye cream girl. 2. Blast the stuper: by blast, I mean tell him/her to buzz off, using only carefully chosen words and being as brief as possible. Then remove yourself from his/her presence. Prolonged interaction with a stuper does neither party any good. I suggest the first line of defense. It’s best to put stupidity behind you as soon as possible. As for the second girl, it’s questionable whether she fell into the stuper category. Perhaps she awaited the arrival of someone important and was expecting him/her to appear on the escalator at any moment. However, I believe she leaned toward being a stuper. She was in the midst of a job; she owed it to her customers and her place of business to, at least, make an effort. Staring at an escalator does not equal effort. Subtlety is not a strongsuit of stupers. You are currently browsing the Counterfeit Humans blog archives for August, 2007.